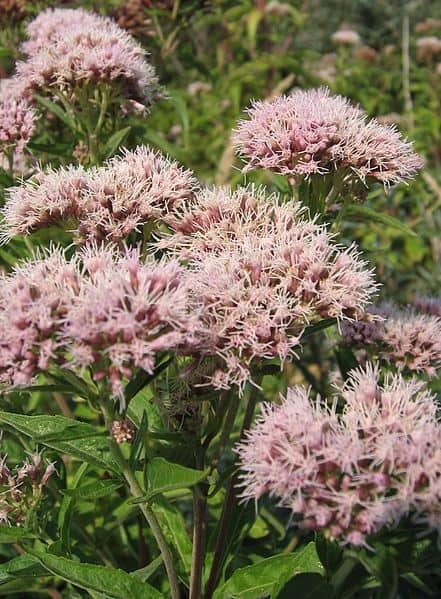 The genus name Eupatorium can be traced back to the ancient Greek king Mithridates Eupator (120-63 BC), who apparently was the first to use species in this genus as a medicine. The species name cannabinum is only due to the resemblance the leaves have to hemp leaf (Cannabis sativa) because those two plant species, in fact, are not related. 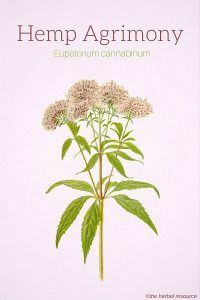 Description: Hemp agrimony is a perennial plant of the Asteraceae family. It can grow up to one and a half meters, or five feet, in height. The erect stems are reddish-brown covered with fine hairs. The plant flowers from June to September. The flower heads are small and consist of a few tubular florets. The aromatic flowers are usually pink or violet, but white-flowered plants occur. Avicenna (980-1037), a Persian physician and philosopher, wrote about the uses of hemp agrimony as a medicinal plant. This herb also was used by others who practiced Arabic herbal medicine in the early Middle Ages, primarily as an invigorating tonic and detoxifying agent. The plant contains flavonoids, a benzofuran (Euparin), phenols, tannins, resin, and inulin. 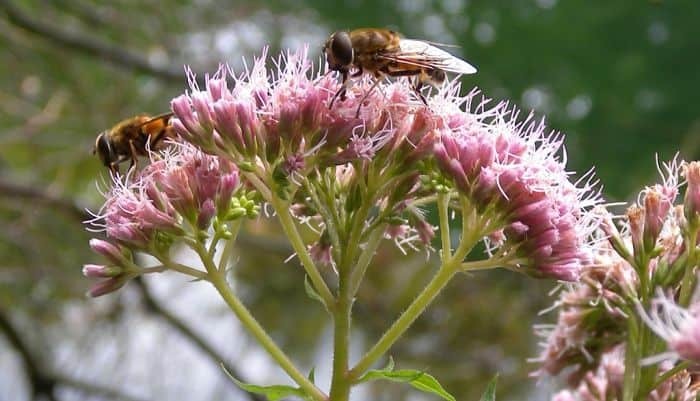 The essential oil extracted from hemp agrimony contains Thymol, Azulene, Cymene to name a few. Cymene seems to have antiviral properties and the water-soluble polysaccharides found present in the herb are thought to stimulate the immune system in a positive way. This herb has been used as an herbal remedy for viral infections such as colds and flu. Additionally it has been used to treat high fever. Some recent studies have indicated that it could be helpful in treating cancer but more research is needed to confirm this. Ailments such as poor bile flow, gallbladder inflammation, and gallstones have been treated by using this herb. It has otherwise been used for liver and biliary disorders and also to stimulate the excretion of toxins through the kidneys. Hemp agrimony may be used internally as an herbal tea to increase appetite, for indigestion and to treat rheumatic disorders such as rheumatism and arthritis. The root of the plant can act as both laxative and diuretic. Ingested in large doses the herb can be strongly laxative but in small doses, it can, in combination with other herbs, be used for constipation. External uses of hemp agrimony, in the form of tincture, include treatments of minor skin infections, bleeding, bruising and wounds. The leaves have been added to bread to prevent mold growth and vegetable juice made from the leaves has been rubbed into the fur of animals as an insect repelling agent. The plant is cut when it is in full bloom and then used in herbal tea, liquid extracts and tinctures. The roots and rhizomes are dug up in the autumn and dried for later use as a decoction or in tinctures. For proper doses a trained herbalist should be consulted as the right dose of hemp agrimony depends on few factors such as age and overall health. Most therapeutic doses used today come from traditional use because at this time there is not enough scientific information to determine an appropriate range of doses for this herb. Hemp agrimony should be avoided by pregnant and nursing mothers. Higher doses than recommended could lead to irritation of the digestive tract, nausea, vomiting and diarrhea. Bown, Deni: The Royal Horticultural Society New Encyclopedia of Herbs; Their Uses. London, England. Dorling Kindersley 2002. Grieve, Mrs. M.: A Modern Herbal. London, England. Penguin Books 1980. Great discovery ! This plant grows abundantly on my lot. I am interested in making a tincture. Thank you for the info.